Reviewing source documents really brought Joan's case into focus. Missing pieces changed the investigative focus how to identify Joan's killer. The list of discrepancies is very long ruling out human error or incompetence. None of Tim Burke's evidence, witnesses, or comingled cases stand up under scrutiny. I am focusing on a few significant pieces that were hidden. 1. An eyewitness identified and described the man that left Logan Airport with Joan on November 28, 1981. The lead was suppressed. 2. A friend of Carmen Tammaro, Patty Bono, placed an anonymous call on January 20, 1982, and implicated Leonard Paradiso in the murders of Marie Iannuzzi and Joan. 3. Burke falsely claimed a John Doe grand jury on March 5, 1982, in the Iannuzzi case. He targeted Paradiso. 4. Tr. Carl Sjoberg implicated Paradiso in another Boston case, Joan Webster, to other authorities on March 11, 1982. 5. Carmen Tammaro met with Paradiso on August 1, 1982 and accused him of murdering Joan on his boat. 6. Robert Bond was transferred to the Charles Street Jail and positioned close to Paradiso on December 8, 1982. 7. Palombo filed a false affidavit to the court for a search warrant claiming Burke received an unsolicited letter from Bond on or about January 5, 1983. 8. MSP met with Bond on January 10, 1983. MSP fed information to Bond about the Iannuzzi and Joan's case, including Tammaro's boat theory. 9. Bond mailed the letter to his wife with an inner envelope addressed to Burke on January 10, 1983, from Concord, and received after January 14,1983. 10. MSP met with Bond on January 14, 1983, and offered enticements including Webster reward money. Bond did not know the manner of Joan's death or the location where Paradiso had moored his boat. After working with MSP, Bond claimed Paradiso struck Joan in the head with a whiskey bottle and dumped her in Boston Harbor. 11. Burke gained a conviction in the Iannuzzi case on July 24, 1984, hiding exculpatory evidence. 12. Judge Bruce Selya affirmed on April 9, 1985, based on undisputed evidence, the boat, the alleged crime scene, did not exist by August 1981 when Paradiso filed for bankruptcy. The alleged crime scene did not exist when Joan disappeared on November 28, 1981. 13. Burke, Palombo, and George Webster continued to make public statements claiming Paradiso murdered Joan on his boat. 14. On April 18, 1990, Joan's skull was discovered in a heavily wooded and remote area in Hamilton, MA, more than 30 miles from the alleged crime scene. The grave was found after a week long search. 14. Burke announced his publication on November 28, 2006, with public support from George and Eleanor Webster. 15. Burke's book was released in February 2008. He gives a graphic description alleging Paradiso raped and murdered Joan Webster on his boat, an impossible crime. 16. Carmen Tammaro and Andrew Palombo worked with Bond to construct his statement. Bond's interview on January 14, 1983, and the letter received after that date, included the correct manner of death with correct detail more than seven years before Joan surfaced. This was information only known to the killer or complicit parties. Tammaro and Palombo are complicit n Joan's murder. It seems clear to me that the key people involved in promoting the Paradiso/boat theory were shielding the man that maneuvered Joan to a blue car on November 28, 1981, and left Logan. The Bond statement was fabricated, and Burke and Palombo perpetrated a fraud on the courts, false statements to federal authorities, and the public. This was a cover up. Source documents affirm who knew about the eyewitness description and case CR 85-010-S affirming the boat did not exist when Joan disappeared. I'm getting some very interesting feedback to the question who would Tim Burke, Andrew Palombo, Carmen Tammaro, and George Webster protect. There is already documented history of corruption during this era in Boston. It can already be established authorities in MA shielded individuals, some were known criminals. Why? The shielded individuals had influence, control, and preyed on cops on the take. Some authorities also shielded each other if someone got involved in an unsavory situation. From my perspective after reviewing source documents, Tim Burke was manipulated. He took orders from higher ups. He was fed the stories and information from Andrew Palombo and went along with it. I learned some personal information about Burke that might reflect the "perk" Burke was receiving. I won't state it here since it is not something I can corroborate, but a tidbit that I factor in to my overall view. The information came from someone who worked for Tim Burke and something she personally encountered. There are too many details, known facts, that point to Andrew Palombo's involvement in Joan's loss. It makes sense he would try to shift attention away from himself. He is protecting himself. I still do not see him having his own motive, but influenced, probably by the man at Logan that maneuvered Joan to another car. Carmen Tammaro was Palombo's superior. He circled the wagon and shielded his subordinate. Tammaro and Palombo had knowledge of what happened to Joan. They guided the interview with Bond and inserted the correct manner of death with correct detail more than seven years before Joan surfaced. That's information that was only known to the killer or someone complicit with the crime. Who would George Webster shield from justice for his own daughter's murder? George was the most visible for the family's position, but the accusations extend to Eleanor, Steve, and Anne. This is a patriarchal family. Whatever George said is what the family will maintain. So, who would all of Joan's blood relatives shield instead of seeking justice for Joan? I went to source documents for my information, because this whole Paradiso/boat scenario did not make sense. I can see nothing to support the family's allegations that Leonard Paradiso raped and murdered Joan on his boat. I followed my instincts and think for myself. George and Eleanor had the information that conflicted with this explanation. A few responses tried to come up with some justification for the Webster family to support false allegations. To me, any rationale is a stretch and does not fit with the personalities in the Webster family. There is no good reason I can think of for a parent or sibling to abandon justice for Joan, but that's what they did. The Websters secreted the lead with an eyewitness description of the man that maneuvered Joan to a different car. She ended up brutally murdered. George shielded the man seen with Joan at Logan. The person responsible for Joan's murder is the man seen with Joan at Logan aided and abetted by the MSP. He was a middle-aged white male, under 6', and approximately 160 pounds. He is described wearing glasses and having a beard. The man was travelling, he had a very heavy suitcase. Joan knew him, she announced he was with her to the Town Taxi driver. Based on what happened to Joan after she was maneuvered to a different car, this was premeditated. That means the man at Logan knew Joan's travel plans; the plans had recently changed. The man said, "we" don't want to take this cab. He had influence over Joan. Her suitcase was removed from the trunk of the Town Taxi, and she left with the man in a blue car. Four people continued to promote the Paradiso boat theory despite having evidence to the contrary in their possession. 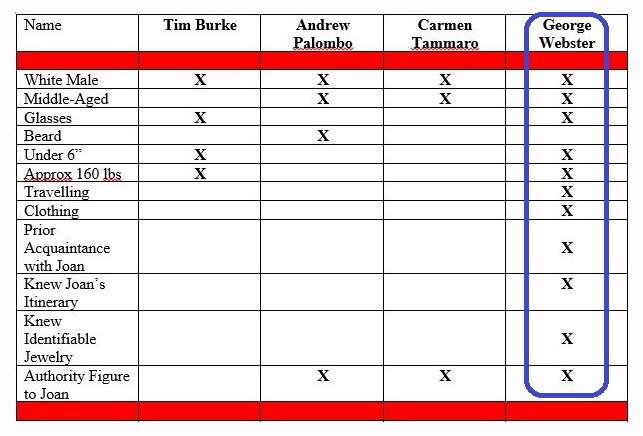 The chart below compares the four individuals, Tim Burke, Andrew Palombo, Carmen Tammaro, and George Webster, to the evidence learned in source documents. the man seen leaving Logan with Joan on November 28, 1981.
attention from the offender seen with Joan at Logan. at known locations and Joan's body. Part 4 is look at the current posture. This is step one identifying the offender(s) responsible for Joan's loss. Step one, the suppressed lead from the eyewitness describing the man seen leaving Logan with Joan on November 28, 1981.
Review the facts. In December 1981, the police took an eyewitness report. Joan was identified in the eyewitness account given by a Town Taxi driver. His description of Joan was spot on. Joan informed the cabbie the man was with her, she knew her assailant. The man exchanged words with the cabbie over a heavy suitcase; he was travelling. The man told Joan, "we" don't want to take this cab. He was an authority figure to her. The man maneuvered Joan to a different car. The cabbie was not able to identify the blue car as a known cab company, but it was in the cab line. This was the critical point. We know what happened to Joan. A legitimate investigation would have been looking for at least two individuals, the man with Joan and the driver of the blue car. The next thing I looked at was the disposal of the evidence and the body. Andrew Palombo checks those boxes. Offenders work in areas they are familiar with. Palombo worked at F Barracks at Logan, the last place Joan was seen. An MSP officer would have access to the cabline. Joan's purse was found along Route 107. Palombo knew this area very well for multiple reasons. He was the lead officer on the Iannuzzi case, that was improperly entangled with Joan's case. Her body was found in the vicinity in 1979. Palombo took charge of that case in February 1981, and was friends with the prime suspect David Doyle, Marie's boyfriend. 107 was also a route from Palombo's home in Peabody to work at Logan. There is a police report in January 1982 of an undercover cop giving a ride to a woman at the Greyhound Bus station, the location where Joan's suitcase was recovered in January 1982. Palombo was positively identified following two women at Logan in December 1982 and giving them a ride. The timing coincided with the MSP working with the snitch Robert Bond. Palombo claimed Burke received an unsolicited letter from Bond. That is false. Tammaro and Palombo fed information to Bond that included the correct manner of death with correct detail more than seven years before Joan surfaced. That is information only known to the killer or someone complicit in the crime. Palombo lived a short distance from Route 129 and exit 16 to Chebacco Road where Joan's skeleton was found. He was familiar with the remote and heavily wooded area. He lived just west of the barricades in Lynn, MA, on November 28, 1981, because of the 12 alarm fire. Identifying the offender(s) means taking off the blinders and looking at who had knowledge, but continued to promote a false explanation. In December 1981, Palombo and Tammaro, MSP, had knowledge of the eyewitness lead. It was contained in MSP files turned over to the current custodian. A police report confirms George Webster was also in possession of the lead. Visuals really help grasp what was going on. Joan's remains surfaced on April 18, 1990. She was found buried on Chebacco Road in Hamilton, MA. The discovery completely blew the state's theory and Robert Bond's statement out of the water. Joan was found in a heavily wooded area, very remote, more than 30 miles from the alleged crime scene. She was not in Boston Harbor as claimed. How in the hell did Joan get from Logan Airport to this spot? The first map I am uploading is the gravesite as published in the papers in 1990. The next image is a map of the area with known information, location of Joan's purse, the Great Lynn fire, location of the suitcase, Palombo's address. I also added the location of Burke's alleged evidence of the boat and gun. The next map crosses off the boat and gun. Source documents debunk that evidence. The boat did not exist when Joan disappeared on November 28, 1981, affirmed by Judge Bruce Selya in case CR 85-010-S. Burke's witness claiming his divers found a gun Burke speculated was used to force Joan on the boat that did not exist, was debunked when Burke's witness was interviewed by the FBI. The 302 report indicates the divers who worked for the witness found a Mercedes in the water, not a gun. Palombo lived at 247 Lynn Road in Peabody, MA. I have also added a bar that indicates where road blocks were set up because of the fire in Lynn. The next map shows the path from Logan to the gravesite. Note: the path veers left at Lynn because of the barricades. The logicall path is up Broadway that is a main route to or from Palombo's house to the airport. Palombo's house is close to the on ramp for Route 128 that goes directly to exit 16 and Chebacco Road. You have to travel along Route 128 to get to Chebacco Road coming from the south. It is more than a stretch to think the disbursement of Joan's belongings and her remains were coincidentally located in areas familiar and close to Palombo. This was no coincidence evidenced by how Palombo threw this investigation off track and his knowledge of the manner of death with correct detail more than seven years before Joan surfaced. Here is the path from Palombo's house to the gravesite. OK, I am taking this step by step. Four people promoted the theory Leonard Paradiso murdered Joan on his boat; Tim Burke, Andrew Palombo, Carmen Tammaro, and George Webster. Step one: Joan was seen at Logan on November 28, 1981, and cabbie Fenton Moore gave an eyewitness description of the man Joan left with in a blue car. The description does not fit Leonard Paradiso. Four people promoted Leonard Paradiso murdered Joan on his boat and dumped her in Boston Harbor. Three of them had knowledge of the eyewitness description in December 1981; Andrew Palombo, Carmen Tammaro, and George Webster. Saugus PD and Harvard Campus PD also knew about this lead in December 1981. The lead was suppressed. Step 2: Joan's skull surfaced on April 18, 1990, in a remote wooded area on Chebacco Road in Hamilton, MA, more than 30 miles from the alleged crime scene. After a weeklong search, the grave was discovered. Cause of death, blunt force trauma to the head. How did Joan get from Point A at Logan to Point B in Hamilton, MA? How did the investigation go off the rails pursuing Paradiso? Why did Tim Burke, Andrew Palombo, Carmen Tammaro, and George Webster maintain the boat theory? How did Joan go from Point A to Point B? The man at the airport maneuvered her from the Town Taxi to the blue car. How did the investigation go off the rails to implicate Leonard Paradiso? On or about January 20, 1982, Patty Bono placed an anonymous call to the Saugus PD implicating Paradiso for the murder of Marie Iannuzzi and Joan's disappearance. What do we know about Patty Bono? She grew up in the NE with Paradiso and Carmen Tammaro, one of the central officers involved in Joan's investigation. She made an unverified allegation against Paradiso for a 1972 assault. There was no corroborating or contemporaneous evidence to support her claim. No witnesses were provided to support her claims. The defender she named, Willie Fopiano, was not available to testify. However, he published a book with his detailed account of that time period. His account did not support Bono's allegations. Bono provided no verified knowledge or evidence to implicate Paradiso in the anonymous call or testimony in the Iannuzzi pretrial hearing. Her testimony was nothing more than "she said" with nothing to back it up. 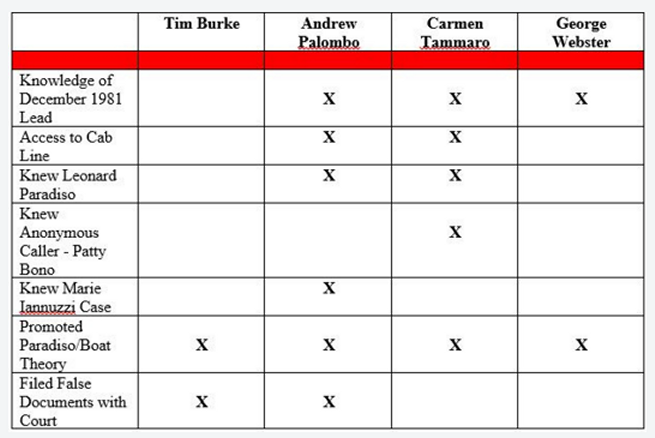 Bono was identified by Tim Burke during the Iannuzzi pretrial making a call implicating Paradiso. Chief Donald Peters of the Saugus PD affirmed the anonymous call to his office. Bono affirmed placing the call to the Saugus PD. She posted her response in a public forum in response to questions raised about her allegations. Bono was not credible, apparently making up a story about a 1972 assault and implicating Paradiso for other crimes without evidence. Leonard Paradiso was targeted for Joan's loss beginning on or about January 20, 1982, based on unsubstantiated, false allegations made by an involved officer's friend. The allegations diverted attention away from the man at the airport. Paradiso was not identified publicly until January 1983, a full year later. Step by step to identify Joan's killer. 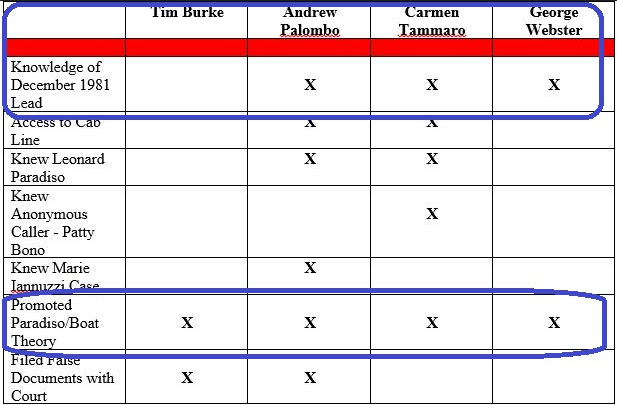 Four people promoted the Paradiso/boat theory despite having evidence to the contrary; Tim Burke, Andrew Palombo, Carmen Tammaro, and George Webster. I get a lot of questions about motive. That is reasonable. When you can answer the why, you get to the who. 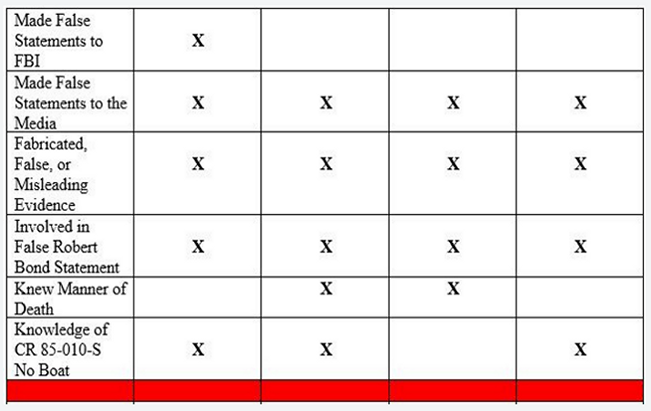 I am looking at why each of the four individuals promoted a false explanation for Joan's loss. An eyewitness described the offender at Point A on November 28, 1981, and how the man left with Joan from Logan Airport. This lead was suppressed. Joan's remains surfaced at Point B on April 18, 1990, in Hamilton, MA. Patty Bono, who grew up in the NE with involved officer Carmen Tammaro, placed an anonymous call to the Saugus PD implicating Leonard Paradiso in the 1979 Marie Iannuzzi murder and Joan's disappearance. Paradiso, who did not fit the eyewitness description, was targeted in Joan's loss beginning on or about January 20, 1982. Tim Burke claims he received an unsolicited letter from two-time convicted murderer, Robert Bond, on or about January 5, 1983. Allegedly, the letter detailed the Marie Iannuzzi murder and Joan's murder. According to documents filed with the court, Burke scheduled an interview with the MSP. Bond met with the MSP on January 10, 1983, affirmed in court records. Bond met again with the MSP on January 14, 1983 in a taped interview. The interview was also affirmed in documents filed with the court. Transcripts of the interview affirm that no letter had been received as Burke claimed. The letter was mailed on January 10, 1983, AFTER meeting with the MSP. the letter was received AFTER the interview on January 14, 1983. This was an investigation based on a lie. Authorities funneled information through snitch Robert Bond and solicited a letter. Robert Bond is discredited. Authorities perpetrated a fraud on the courts. The MSP interview transcript and the Bond letter both contained information in both cases known to be false. But, both also contained the correct manner of death with correct detail for Joan's murder more than seven years before Joan surfaced. Bond's information was provided by the authorities. Two officers, Andrew Palombo and Carmen Tammaro are identified in meetings working to obtain Bond's statement, and were central in Joan's investigation. Andrew Palombo and Carmen Tammaro knew the correct manner of death with correct detail, information only known to the killer or someone complicit in the crime. Four people promoted the false explanation Paradiso murdered Joan on his boat; Tim Burke, Andrew Palombo, Carmen Tammaro, and George Webster. An eye witness described the offender with Joan at Logan, Point A, and how they left the airport on November 28, 1981. The MSP and the Websters were in possession of the lead in December 1981. The lead was suppressed. 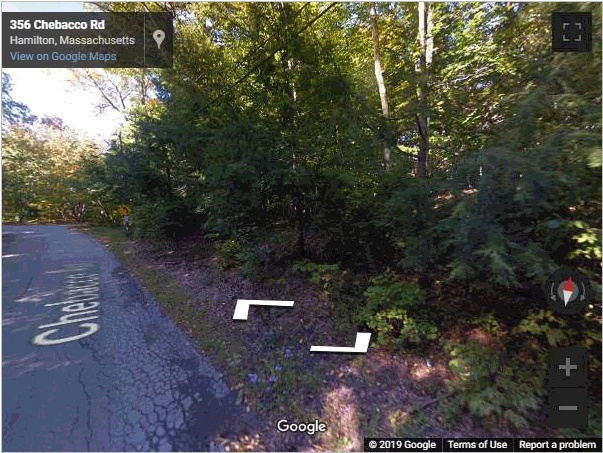 Joan's skull surfaced in a remote, heavily wooded area off Chebacco Road in Hamilton, MA on April 18, 1990, Point B. The grave was discovered after a weeklong search, and her skeleton recovered. What happened between Point A and Point B? Patty Bono, who grew up with involved officer Carmen Tammaro, placed an anonymous call to the Saugus PD implicating Leonard Paradiso for the 1979 Marie Iannuzzi murder and Joan's disappearance with no supporting evidence. Paradiso did not fit the eyewitness description. Paradiso was targeted on or about January 20, 1982. Source documents affirm Burke did not receive an unsolicited letter from snitch Robert Bond - NO LETTER. Authorities funneled information through an unreliable source and solicited a letter. Andrew Palombo and Carmen Tammaro are identifed knowing the correct manner of Joan's death with correct detail, information known only to the killer or someone complicit with the crime. The Bond allegations, promoted by Tim Burke, Andrew Palombo, Carmen Tammaro, and George Webster, accused Paradiso of murdering Joan on his boat and dumping her in Boston Harbor. That is not where Joan was found..
On May 3, 1983, Tim Burke contacted SA Steve Broce of the FBI to instigate a bankruptcy fraud case. Paradiso filed for bankruptcy on August 26, 1981. He was charged with lying on his application. He did not list his boat, the alleged crime scene, in the claim. Court records for case CR 85-010-S are maintained in the National Archives. The current custodian did not have these records in their files. Court records revealed significant information. Tim Burke and Andrew Palombo provided false information to federal authorities. They provided a fake boat registration along with the valid one. The current custodian did not have the fake ID. An FBI 302 was contained in court files. The report discredits Burke's assertion divers found a replica .357 magnum in the water at Pier 7. Burke speculated the gun was used to force Joan on Paradiso's boat. Burke put witnesses on the stand to introduce the alleged gun. Palombo filed a warrant with the court detailing the gun. The FBI 302 report discredits the gun assertion. Diver's found a Mercedes in the water. 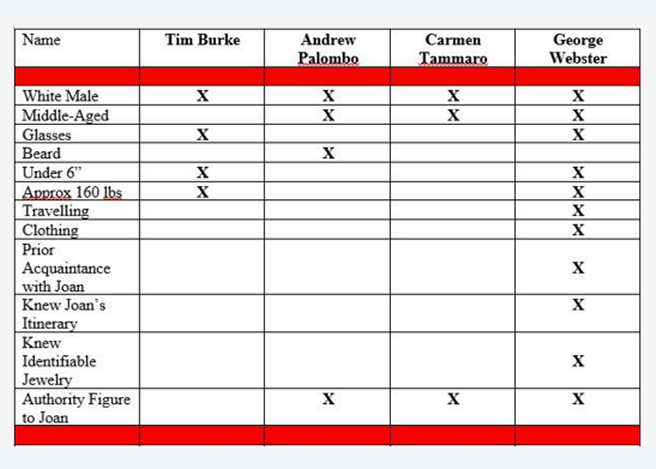 Tim Burke and Andrew Palombo fabricated evidence. Court records revealed high level influence over the case, an insurance policy. On July 13, 1983, Paul Leary, first ADA and Burke's boss, placed a call to a high level official. Records also confirm George Webster was aware of the proceedings in the bankruptcy case, and presented three letters entered into the case. Court records confirmed Paradiso was in bankruptcy court on November 30, 1981, the date Tim Burke alleged Paradiso was swabbing the deck and scuttled his boat. Judge Bruce Selya presided over CR 85-010-S in April 1985, and imposed sentence on May 10, 1985. Selya affirmed the boat, the alleged crime scene, did not exist when Paradiso filed for bankruptcy in August 1981, prior to Joan's loss. Burke lied about the case in his 2008 publication claiming Judge Richard Sterns [sic] imposed sentence on November 1, 1985. Richard Stearns was appointed to the bench in 1993. The alleged crime scene, the boat, did not exist when Joan disappeared on November 28, 1981. The key to resolving Joan's case was to look at the investigation itself, and those promoting a false explanation. Step back and look at what is now known. 1. We have an eyewitness description of the offender with Joan at Logan on November 28, 1981. That lead was concealed by the authorities and George Webster. 2. Authorities targeted Paradiso on January 20, 1982, based on an anonymous call from Patty Bono, friend of involved officer Carmen Tammaro, with no corroborating evidence. 3. Authorities fabricated a story and funneled information through Robert Bond and solicited a letter. Carmen Tammaro and Andrew Palombo identified knowing correct manner of death with correct detail. 4. On May 10, 1985, Judge Bruce Selya affirmed the boat, the alleged crime scene, did not exist when Joan disappeared in case CR 85-010-S.
5. Joan's remains surfaced on April 18, 1990, buried in a remote wooded area off Chebacco Road in Hamilton, MA, more than 30 miles from the alleged crime scene. Prior to the recovery of Joan's skeletal remains, there were efforts to take Paradiso to trial for Joan's loss. Bond would not cooperate. He had been burned cooperating on the Iannuzzi trial. After Joan surfaced, the state's explanation did not hold water. The effort to prosecute Paradiso for Joan's murder was dropped. That says it all; authorities did not have a case. Pressing further risked exposure of malfeasance and the real offender. Four people continued to maintain the Paradiso boat theory; Tim Burke, Carmen Tammaro, Andrew Palombo, and George Webster. The Paradiso boat explanation was a cover up. Charts and graphs really help get the point across! Visuals do help. The location of Joan's remains were further back from the road. The offender that put her there, had to be familiar with the area. It is not easy to find and as you can see, this is a heavily wooded area. Of the four people who promoted a false narrative to explain Joan's loss, Tim Burke, Andrew Palombo, Carmen Tammaro, and George Webster, Andrew Palombo knew this area. That was confirmed by Chief Walter Cullen of the Hamilton PD. Palombo lived in close proximity to this area. I am not big on coincidences. Source documents exposed too many "coincidences" to believe the Paradiso/boat theory was simply human error. To narrow the scope, you would have to believe known facts were simply coincidences to believe Andrew Palombo was not complicit or involved in Joan's murder. 2. Friend of Palombo's superior implicated Paradiso in January 1982. 3. Palombo was lead officer on the Maria Iannuzzi case as of February 1981. Paradiso was named as one of 2 suspects. Palombo was a friend of the other suspect, David Doyle, the victim's boyfriend. 4. Palombo worked at Logan Airport, the last place Joan was seen. 5. Joan's purse and wallet just happened to turn up in proximity to the Marie Iannuzzi crime scene, and the route from Palombo's home to Logan. 6. Joan's suitcase just happened to turn up at the Boston Greyhound Station. A police report confirms undercover police activity at the bus station, and Palombo was an undercover officer. 7. State witness Robert Bond just happened to be moved in close proximity to Paradiso at the Charles Street Jail. 8. State witness Robert Bond just happened to come forward with a letter after speaking with MSP implicating Paradiso for Iannuzzi and Webster cases. This indicates the letter and allegations were solicited. 9. Palombo and Tammaro knew the correct manner of death with correct detail more than 7 years before Joan surfaced. The information that would only be known to the killer or someone complicit with the crime, was funneled through an unreliable source. 10. The foundational documents for Joan's investigation, the Bond letter and the transcript of the January 14, 1983, interview with the MSP, were sealed in the Iannuzzi case. 11. Palombo aggressively pursued Paradiso irrespective of exculpatory evidence in the possession of the MSP. Palombo had evidence the boat, the alleged crime scene did not exist at the time Joan disappeared. 12. Joan's body just happened to surface in an area familiar to Palombo and in close proximity to his address. 13. The pressure to charge and prosecute Paradiso for Joan's murder abruptly stopped after Joan surfaced, after recovery of the body. 14. Records the MSP turned over to the current custodian were grossly deficient of relevant files necessary to administer justice for Joan's loss. This is just a sample of the discrepancies or the "coincidences" you would have to swallow to believe this was an earnest investigation. Palombo is one of the offenders complicit in Joan's loss.